Electoral fraud, election manipulation, or vote rigging is illegal interference with the process of an election. Acts of fraud affect vote counts to bring about an election result, whether by increasing the vote share of the favored candidate, depressing the vote share of the rival candidates, or both. What constitutes electoral fraud under law varies from country to country. Many kinds of election fraud are outlawed in electoral legislation, but others are in violation of general laws, such as those banning assault, harassment or libel. Although technically the term 'electoral fraud' covers only those acts which are illegal, the term is sometimes used to describe acts which are legal but considered morally unacceptable, outside the spirit of electoral laws, or in violation of the principles of democracy. Show elections, in which only one candidate can win, are sometimes classified as electoral fraud, although they may comply with the law. In national elections, successful electoral fraud can have the effect of a coup d'état or corruption of democracy. In a narrow election, a small amount of fraud may be enough to change the result. Even if the outcome is not affected, revelation of fraud can have a damaging effect, if not punished, as it can reduce voters' confidence in democracy. A list of threats to voting systems, or electoral fraud methods considered as sabotage, is kept by the National Institute of Standards and Technology. and is considered sabotage of the highest degree. Electoral fraud can occur in advance of voting if the composition of the electorate is altered. The legality of this type of manipulation varies across jurisdictions. Deliberate manipulation of election outcomes is widely considered a violation of the principles of democracy. In many cases it is possible for authorities to artificially control the composition of an electorate in order to produce a foregone result. One way of doing this is to move a large number of voters into the electorate prior to an election, for example by temporarily assigning them land or lodging them in flophouses. Many countries prevent this with rules stipulating that a voter must have lived in an electoral district for a minimum period (for example, six months) in order to be eligible to vote there. However, such laws can also be used for demographic manipulation as they tend to disenfranchise those with no fixed address, such as the homeless, travelers, Roma, students (studying full-time away from home), and some casual workers. Another strategy is to permanently move people into an electoral district, usually through public housing. If people eligible for public housing are likely to vote for a particular party, then they can either be concentrated into one area, thus making their votes count for less, or moved into marginal electorates, where they may tip the balance towards their preferred party. One notable example of this occurred in the City of Westminster in England under Shirley Porter. Immigration law may also be used to manipulate electoral demography. For instance, Malaysia gave citizenship to immigrants from the neighboring Philippines and Indonesia, together with suffrage, in order for a political party to "dominate" the state of Sabah; this controversial process was known as Project IC. A method of manipulating primary contests and other elections of party leaders is related to this. People who support one party may temporarily join another party (or vote in a crossover way, when permitted) in order to elect a weak candidate for that party's leadership. The goal ultimately is defeat of the weak candidate in the general election by the leader of the party that the voter truly supports. The composition of an electorate may also be altered by disenfranchising some classes of people, rendering them unable to vote. In some cases, states have passed provisions that raised general barriers to voter registration, such as poll taxes, literacy and comprehension tests, and recordkeeping requirements, which in practice were applied against minority populations to discriminatory effect. From the turn of the century into the late 1960s, most African Americans in the southern states of the former Confederacy were disenfranchised by such measures. Given the disproportionate prosecution and incarceration of minorities in the United States, various states that have strict laws against voting by prison inmates, convicted felons, even those who have completed probation, have essentially targeted such minorities for disenfranchisement. Compared to most European nations, many states in the US have much more severe laws that prevent convicted felons who have served their sentences from ever voting again, marginalizing them. In some cases voters may be invalidly disenfranchised, which is true electoral fraud. For example, a legitimate voter may be 'accidentally' removed from the electoral roll, making it difficult or impossible for the person to vote. Corrupt election officials may misuse voting regulations such as a literacy test or requirement for proof of identity or address in such a way as to make it difficult or impossible for their targets to cast a vote. If such practices discriminate against a religious or ethnic group, they may so distort the political process that the political order becomes grossly unrepresentative, as in the post-Reconstruction or Jim Crow era until the Voting Rights Act of 1965. Groups may also be disenfranchised by rules which make it impractical or impossible for them to cast a vote. For example, requiring people to vote within their electorate may disenfranchise serving military personnel, prison inmates, students, hospital patients or anyone else who cannot return to their homes. Polling can be set for inconvenient days, such as midweek or on holy days of religious groups. (example: Sabbath or other holy days of a religious group whose teachings determine that voting is a prohibited on such a day) Communities may also be effectively disenfranchised if polling places are not provided within reasonable proximity (rural communities are especially vulnerable to this), or are situated in areas perceived by some voters as unsafe. In the Canadian federal election of 1917, during the Great War, the Union government passed the Military Voters Act and the Wartime Elections Act. The Military Voters Act permitted any active military personnel to vote by party only and allowed that party to decide in which electoral district to place that vote. It also enfranchised those women who were directly related or married to an active soldier. These groups were believed to be disproportionately in favor of the Union government, as that party was campaigning in favor of conscription. The Wartime Elections Act, conversely, disenfranchised particular ethnic groups assumed to be disproportionately in favor of the opposition Liberal Party. In 2012, 10 American states passed laws requiring voters to show a photo ID (often specifically defined) in order to vote, citing protection against electoral fraud. The Brennan Center for Justice at the New York University Law School conducted a study and concluded that minorities, the poor, and the elderly are less likely to have photo IDs, and that such groups were more likely to live long distances from ID-issuing offices. Additionally, partisan politics has been exposed as a major factor in the introduction of voter ID legislation by Republican-dominated state legislatures. Such legislation would disenfranchise many people who have traditionally voted for Democratic Party nominees, and thus benefit the Republican Party in elections. Stanford University professor Beatriz Magaloni described a model governing the behavior of autocratic regimes. She proposed that ruling parties can maintain political control under a democratic system without actively manipulating votes or coercing the electorate. Under the right conditions, the democratic system is maneuvered into an equilibrious state in which divided opposition parties act as unwitting accomplices to single-party rule. This permits the ruling regime to abstain from illegal electoral fraud. Preferential voting systems such as score voting, instant-runoff voting, and single transferable vote are designed to prevent systemic electoral manipulation and political duopoly. Voter intimidation involves putting undue pressure on a voter or group of voters so that they will vote a particular way, or not at all. Absentee and other remote voting can be more open to some forms of intimidation as the voter does not have the protection and privacy of the polling location. Intimidation can take a range of forms. Violence or the threat of violence: In its simplest form, voters from a particular demographic or known to support a particular party or candidate are directly threatened by supporters of another party or candidate or by those hired by them. In other cases, supporters of a particular party make it known that if a particular village or neighborhood is found to have voted the 'wrong' way, reprisals will be made against that community. Another method is to make a general threat of violence, for example a bomb threat which has the effect of closing a particular polling place, thus making it difficult for people in that area to vote. One notable example of outright violence was the 1984 Rajneeshee bioterror attack, where followers of Bhagwan Shree Rajneesh deliberately contaminated salad bars in The Dalles, Oregon, in an attempt to weaken political opposition during county elections. Attacks on polling places: Polling places in an area known to support a particular party or candidate may be targeted for vandalism, destruction or threats, thus making it difficult or impossible for people in that area to vote. Legal threats: In this case voters will be made to believe, accurately or otherwise, that they are not legally entitled to vote, or that they are legally obliged to vote a particular way. Voters who are not confident about their entitlement to vote may also be intimidated by real or implied authority figures who suggest that those who vote when they are not entitled to will be imprisoned, deported or otherwise punished. For example, in 2004, in Wisconsin and elsewhere voters allegedly received flyers that said, "If you already voted in any election this year, you can’t vote in the Presidential Election", implying that those who had voted in earlier primary elections were ineligible to vote. Also, "If anybody in your family has ever been found guilty of anything you can’t vote in the Presidential Election." Finally, "If you violate any of these laws, you can get 10 years in prison and your children will be taken away from you." Another method, allegedly used in Cook County, Illinois in 2004, is to falsely tell particular people that they are not eligible to vote. The most famous episodes of vote buying came in 18th century England, when two or more rich aristocrats spent whatever money it took to win. The notorious "Spendthrift election" came in Northamptonshire in 1768, when three earls spent over ₤100,000 each to win a seat. Voters may be given money or other rewards for voting in a particular way, or not voting. In some jurisdictions, the offer or giving of other rewards is referred to as "electoral treating". Electoral treating remains legal in some jurisdictions, such as in the Seneca Nation of Indians. People may distribute false or misleading information in order to affect the outcome of an election. For example, in the Chilean Presidential election of 1970 the Central Intelligence Agency used "black propaganda"—materials purporting to be from various political parties—to sow discord between members of a coalition between socialists and communists. Another use of disinformation is to give voters incorrect information about the time or place of polling, thus causing them to miss their chance to vote. The Democratic Party of Wisconsin alleged that Americans for Prosperity engaged in this when a flier printed in August 2011 and distributed largely to Democratic-majority wards gave an incorrect return date for absentee ballots; Americans for Prosperity said it was a misprint. As part of the 2011 Canadian federal election voter suppression scandal, Elections Canada traced fraudulent phone calls, telling voters that their polling stations had been moved, to a telecommunications company that worked with the Conservative Party. In 2014, Americans for Prosperity, supported by the Koch brothers, was again accused of distributing disinformation by mailing out incorrect or misleading information in hundreds of thousands of mailers to voters in North Carolina, a swing state, that included the wrong deadline for voter registration and other inaccurate information. APD Deputy Director Donald Bryson claimed the mailings were a mistake and that they had not paid enough attention to detail. Ballot papers may be used to discourage votes for a particular party or candidate, using design or other features which confuse voters into voting for a different candidate. For example, in the 2000 U.S. presidential election, Florida's butterfly ballot paper was criticized as poorly designed, leading some voters to vote for the wrong candidate. The ballot was designed by a Democrat; that party was assessed as the most harmed by voter errors because of this design. Poor or misleading design is not usually illegal and therefore not technically election fraud, but can subvert the principles of democracy. Sweden has a system with separate ballots used for each party, to reduce confusion among candidates. But ballots from Sweden Democrats have been mixed with ballots from the larger Swedish Social Democratic Party, which used a very similar font for the party name written on the top of the ballot. Another method of confusing people into voting for a different candidate than intended is to run candidates or create political parties with similar names or symbols as an existing candidate or party. The goal is to mislead voters into voting for the false candidate or party to influence the results. Such tactics may be particularly effective when a large proportion of voters have limited literacy in the language used on the ballot. Again, such tactics are usually not illegal but often work against the principles of democracy. Another way of possible electoral confusion, is multiple variations of voting by different electoral systems. This may cause ballots to be counted as invalid, if the wrong system is used. For instance, if a voter puts a first-past-the-post cross in a numbered single transferable vote ballot paper, it is invalidated. For example, in Scotland and other parts of the United Kingdom, up to four different voting systems and types of ballots maybe be used, based on the jurisdictional level of elections for candidates. Local elections are determined by single transferable votes; Scottish parliamentary elections by the additional member system; national elections for the UK Parliament by first-past-the-post; and elections to the European Parliament by a party list system. 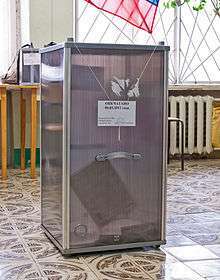 Transparent ballot box used in Russia to prevent election officials from pre-stuffing box with fake ballots. A specialized ballot box used to assist ballot stuffing, featured in Frank Leslie's Illustrated Newspaper in 1856. Ballot stuffing, or "ballot-box stuffing", is the illegal practice of one person submitting multiple ballots during a vote in which only one ballot per person is permitted. The name originates from the earliest days of this practice, in which people literally did stuff more than one ballot in a ballot box at the same time. Ballot stuffing is possible with one version of the California-based Sequoia touchscreen voting machine. It has a yellow button on the back side which, when pressed, allows repeated voting. But, by design, pressing the button triggers two audible beeps, which could trigger election observers to intervene to invalidate such illegal voting. Many elections feature multiple opportunities for unscrupulous officials or 'helpers' to record an elector's vote differently from their intentions. Voters who require assistance to cast their votes are particularly vulnerable to having their votes stolen in this way. For example, a blind person or one who cannot read the language of the ballot paper may be told that they have voted for one party when in fact they have been led to vote for another. This is similar to the misuse of proxy votes; however in this case the voter will be under the impression that they have voted with the assistance of the other person, rather than having the other person voting on their behalf. Where votes are recorded through electronic or mechanical means, the voting machinery may be altered so that a vote intended for one candidate is recorded for another. Proxy voting is particularly vulnerable to election fraud, due to the amount of trust placed in the person who casts the vote. In several countries there have been allegations of retirement home residents being asked to fill out 'absentee voter' forms. When the forms are signed and gathered, they are secretly rewritten as applications for proxy votes, naming party activists or their friends and relatives as the proxies. These people, unknown to the voter, cast the vote for the party of their choice. This trick relies on elderly care home residents typically being absent-minded, or suffering from dementia. In the United Kingdom, this is known as 'granny farming.' The law was changed to prevent a single voter from acting as a proxy for more than two non-family members. It was intended to reduce the ability of one person to commit fraud. One of the simplest methods of electoral fraud is to destroy ballots for the 'wrong' candidate or party. This is unusual in the 21st century in functioning democracies, as it is difficult to do without notice. But, in a very close election it might be possible to destroy a very small number of ballot papers without detection, thereby changing the overall result. Blatant destruction of ballot papers can render an election invalid and force it to be re-run. If a party can improve its vote on the re-run election, it can benefit from such destruction as long as it is not linked to it. Another method is to make it appear that the voter has spoiled his or her ballot, thus rendering it invalid. Typically this would be done by adding another mark to the paper, making it appear that the voter has voted for more candidates than entitled, for instance. It would be difficult to do this to a large number of paper ballots without detection. All voting systems face threats of some form of electoral fraud. The types of threats that affect voting machines can vary from other forms of voting systems, some threats may be prevented and others introduced. Some forms of electoral fraud specific to electronic voting machines are listed below. Recent research at Argonne National Laboratories demonstrates that if a malicious actor is able to gain physical access to a voting machine, it can be a simple process to manipulate certain electronic voting machines, such as the Diebold Accuvote TS, by inserting inexpensive, readily available electronic components inside the machine. Tampering with the software of a voting machine to add malicious code altering vote totals or favor any candidate. In any way even by the products making company. Multiple groups have demonstrated this possibility. Private companies manufacture these machines. Many companies will not allow public access or review of the machines source code, claiming fear of exposing trade secrets. Tampering with the hardware of the voting machine to alter vote totals or favor any candidate. Some of these machines require a smartcard to activate the machine and vote. However, a fraudulent smart card could attempt to gain access to vote multiple times or be pre-loaded with negative votes to favor one candidate over another, as has been demonstrated. Abusing the administrative access to the machine by election officials might also allow individuals to vote multiple times. Election results that are sent directly over the internet from a county count center to the state count center can be vulnerable to a man-in-the-middle attack, where they are diverted to an intermediate web site where the man in the middle flips the votes in favor of a certain candidate and then immediately forwards them on to the state count center. All votes sent over the internet violate chain of custody and hence should be avoided by driving or flying memory cards in locked metal containers from county count centers to the state count center. For purposes of getting quick preliminary statewide results on election night, encrypted votes can be sent over the internet, but final official results should be tabulated the next day only after the actual memory cards arrive in secure metal containers and are counted. Some commentators, such as former Federal Election Commission member Hans von Spakovsky, have claimed that voter impersonation fraud, in which one person votes by impersonating another, eligible voter, is widespread, but documentation has been scarce and prosecutions rare. Numerous others, such as Professor Larry Sabato, and a variety of studies have shown this to be "relatively rare". Since 2013, when the US Supreme Court ruled that a provision of the Voting Rights Act was no longer enforceable, several states have passed voter ID laws, ostensibly to counter the alleged fraud. But many experts counter that voter ID laws are not very effective against some forms of impersonation. These ID laws have been challenged by minority groups that were disadvantaged by the changes. By August 2016, four federal court rulings overturned laws or parts of such laws because they placed undue burdens on minority populations, including African Americans and Native Americans. In each case: Texas, North Carolina, Wisconsin, and North Dakota, and may adversely affect minority voters. The states are required to accept alternatives for the November 2016 elections. These cases are expected to reach the US Supreme Court for hearings. In particularly corrupt regimes, the voting process may be nothing more than a sham, as officials would simply announce whatever results they want, sometimes without even bothering to count the votes. Such practices tend to draw international condemnation, but voters typically have little recourse, as there would seldom be any ways to remove the "winner" from power, short of a revolution. Vote fraud can also take place in legislatures. Some of the forms used in national elections can also be used in parliaments, particularly intimidation and vote-buying. Because of the much smaller number of voters, however, election fraud in legislatures is qualitatively different in many ways. Fewer people are needed to 'swing' the election, and therefore specific people can be targeted in ways impractical on a larger scale. For example, Adolf Hitler achieved his dictatorial powers due to the Enabling Act of 1933. He attempted to achieve the necessary two-thirds majority to pass the Act by arresting members of the opposition, though this turned out to be unnecessary to attain the needed majority. Later, the Reichstag was packed with Nazi party members who voted for the Act's renewal. In many legislatures, voting is public, in contrast to the secret ballot used in most modern public elections. This may make their elections more vulnerable to some forms of fraud, since a politician can be pressured by others who will know how he or she has voted. However, it may also protect against bribery and blackmail, since the public and media will be aware if a politician votes in an unexpected way. Since voters and parties are entitled to pressure politicians to vote a particular way, the line between legitimate and fraudulent pressure is not always clear. As in public elections, proxy votes are particularly prone to fraud. In some systems, parties may vote on behalf of any member who is not present in parliament. This protects those members from missing out on voting if prevented from attending parliament, but it also allows their party to prevent them from voting against its wishes. In some legislatures, proxy voting is not allowed, but politicians may rig voting buttons or otherwise illegally cast "ghost votes" while absent. The two main strategies for the prevention of electoral fraud in society are: 1) Deterrence through consistent and effective prosecution; and 2) Cultivation of mores that discourage corruption. The two main fraud prevention tactics can be summarized as secrecy and openness. The secret ballot prevents many kinds of intimidation and vote selling, while transparency at all other levels of the electoral process prevents and allows detection of most interference. The patterns of conventional behavior in a society, or mores, are an effective means for preventing electoral fraud and corruption in general. A good example is Sweden, where the culture has a strong tendency toward positive values, resulting in a low incidence of political corruption. Until recently Canada had a similar reputation. The In and Out scandal of 2008 and the Robocall scandal of 2011 has tarnished Canada's electoral integrity. An advantage of cultivating positive mores as a prevention strategy is that it is effective across all electoral systems and devices. A disadvantage is that it makes other prevention and detection efforts more difficult to implement because members of society generally have more trust and less of a sense for fraudulent methods. The secret ballot, in which only the voter knows how they have voted, is believed by many to be a crucial part of ensuring free and fair elections through preventing voter intimidation or retribution. Others argue that the secret ballot enables election fraud (because it makes it harder to verify that votes have been counted correctly)  and that it discourages voter participation. Although the secret ballot was sometimes practiced in ancient Greece and was a part of the Constitution of the Year III of 1795, it only became common in the nineteenth century. Secret balloting appears to have been first implemented in the former British colony—now an Australian state—of Tasmania on 7 February 1856. By the turn of the century the practice had spread to most Western democracies. Before this, it was common for candidates to intimidate or bribe voters, as they would always know who had voted which way. Most methods of preventing electoral fraud involve making the election process completely transparent to all voters, from nomination of candidates through casting of the votes and tabulation. A key feature in ensuring the integrity of any part of the electoral process is a strict chain of custody. To prevent fraud in central tabulation, there has to be a public list of the results from every single polling place. This is the only way for voters to prove that the results they witnessed in their election office are correctly incorporated into the totals. End-to-end auditable voting systems provide voters with a receipt to allow them to verify their vote was cast correctly, and an audit mechanism to verify that the results were tabulated correctly and all votes were cast by valid voters. However, the ballot receipt does not permit voters to prove to others how they voted, since this would open the door towards forced voting and blackmail. End-to-end systems include Punchscan and Scantegrity, the latter being an add-on to optical scan systems instead of a replacement. In many cases, election observers are used to help prevent fraud and assure voters that the election is fair. International observers (bilateral and multilateral) may be invited to observe the elections (examples include election observation by the Organization for Security and Cooperation in Europe (OSCE), European Union election observation missions, observation missions of the Commonwealth of Independent States (CIS), as well as international observation organized by NGOs, such as CIS-EMO, European Network of Election Monitoring Organizations (ENEMO), etc.). Some countries also invite foreign observers (i.e. bi-lateral observation, as opposed to multi-lateral observation by international observers). In addition, national legislatures of countries often permit domestic observation. Domestic election observers can be either partisan (i.e. representing interests of one or a group of election contestants) or non-partisan (usually done by civil society groups). Legislations of different countries permit various forms and extents of international and domestic election observation. Election observation is also prescribed by various international legal instruments. For example, paragraph 8 of the 1990 Copenhagen Document states that "The [OSCE] participating States consider that the presence of observers, both foreign and domestic, can enhance the electoral process for States in which elections are taking place. They therefore invite observers from any other CSCE participating States and any appropriate private institutions and organizations who may wish to do so to observe the course of their national election proceedings, to the extent permitted by law. They will also endeavor to facilitate similar access for election proceedings held below the national level. Such observers will undertake not to interfere in the electoral proceedings". Critics note that observers cannot spot certain types of election fraud like targeted voter suppression or manipulated software of voting machines. Various forms of statistics can be indicators for election fraud, e.g. exit polls which diverge from the final results. Well-conducted exit polls serve as a deterrent to electoral fraud. However, exit polls are still notoriously imprecise. For instance, in the Czech Republic, some voters are afraid or ashamed to admit that they voted for the Communist Party (exit polls in 2002 gave the Communist party 2–3 percentage points less than the actual result). When elections are marred by ballot-box stuffing (e.g., the Armenian presidential elections of 1996 and 1998), the affected polling stations will show abnormally high voter turnouts with results favoring a single candidate. By graphing the number of votes against turnout percentage (i.e., aggregating polling stations results within a given turnout range), the divergence from bell-curve distribution gives an indication of the extent of the fraud. Stuffing votes in favor of a single candidate affects votes vs. turnout distributions for that candidate and other candidates differently; this difference could be used to quantitatively assess the amount of votes stuffed. Also, these distributions sometimes exhibit spikes at round-number turnout percentage values. High numbers of invalid ballots, overvoting or undervoting are other potential indicators. Risk-limiting audits are methods to assess the validity of an election result statistically without the effort of a full election recount. In the United States one such case was in Pennsylvania where Bill Stinson won an election based on fraudulent absentee ballots. The courts ruled that his opponent be seated in the state Senate as a result. In the Philippines, former President Gloria Macapagal-Arroyo was arrested in 2011 following the filing of criminal charges against her for electoral sabotage, in connection with the Philippine general election, 2007. She was accused of conspiring with election officials to ensure the victory of her party's senatorial slate in the province of Maguindanao, through the tampering of election returns. One method for verifying voting machine accuracy is Parallel Testing, the process of using an independent set of results compared against the original machine results. Parallel testing can be done prior to or during an election. During an election, one form of parallel testing is the VVPAT. Voter-verified paper audit trail (VVPAT) or verified paper record (VPR) is a method of providing feedback to voters using a ballotless voting system. A VVPAT is intended as an independent verification system for voting machines designed to allow voters to verify that their vote was cast correctly, to detect possible election fraud or malfunction, and to provide a means to audit the stored electronic results. This method is only effective if statistically significant numbers of voters verify that their intended vote matches both the electronic and paper votes. On election day, a statistically significant number of voting machines can be randomly selected from polling locations and used for testing. This can be used to detect potential fraud or malfunction unless manipulated software would only start to cheat after a certain event like a voter pressing a special key combination (Or a machine might cheat only if someone doesn't perform the combination, which requires more insider access but fewer voters). Another form of testing is Logic & Accuracy Testing (L&A), pre-election testing of voting machines using test votes to determine if they are functioning correctly. Another method to insure the integrity of electronic voting machines is independent software verification and certification. Once software is certified, code signing can insure the software certified is identical to that which is used on election day. Some argue certification would be more effective if voting machine software was publicly available or open source. Certification and testing processes conducted publicly and with oversight from interested parties can promote transparency in the election process. The integrity of those conducting testing can be questioned. Testing and certification can prevent voting machines from being a black box where voters can not be sure that counting inside is done as intended. One method that people have argued would help prevent these machines from being tampered with would be for the companies that produce the machines to share the source code, which displays and captures the ballots, with computer scientists. This would allow external sources to make sure that the machines are working correctly. The Help America Vote Act (Pub.L. 107–252), or HAVA, is a United States federal law enacted on October 29, 2002. It was drafted (at least in part) in reaction to the controversy surrounding the 2000 U.S. presidential election, the goals of HAVA are: to replace punchcard and lever-based voting systems; create the Election Assistance Commission to assist in the administration of Federal elections; and establish minimum election administration standards. This was the most important federal legislation of the 20th century to protect voting rights, especially of ethnic and language minorities who had been disenfranchised for decades by states' constitutions and practices. Initially it was particularly important for enforcing the constitutional right of African Americans in the South to vote, where millions of people had been mostly disenfranchised since the turn of the 20th century and excluded from politics. The law has also protected other ethnicities, such as Hispanics, Asians, Native Americans, and language minorities in other states, who have been discriminated against at various times, especially in the process of voter registration and electoral practices. The Civil Rights Act of 1964 (Pub.L. 88–352, 78 Stat. 241, enacted July 2, 1964) was a landmark piece of legislation in the United States that outlawed major forms of discrimination against African Americans and other minorities. 1 2 Myagkov, Mikhail G.; Peter C. Ordeshook; Dimitri Shakin (2009-05-31). The Forensics of Election Fraud: Russia and Ukraine. Cambridge University Press. ISBN 978-0-521-76470-4. Alvarez, Michael; Hall, Thad; Hyde, Susan (2008). Election Fraud: Detecting and Deterring Electoral Manipulation. ↑ Archived October 21, 2006, at the Wayback Machine. ↑ Archived November 11, 2007, at the Wayback Machine. ↑ Williamson, Chilton (1968). American Suffrage from Property to Democracy. Princeton, NJ: Princeton U. Press. ASIN B000FMPMK6. ↑ Saltman, Roy G. (January 2006). The History and Politics of Voting Technology. Palgrave Macmillan. ISBN 1-4039-6392-4. ↑ Magill v. Porter Magill v. Weeks, H=House of Lords Judgments, 13 December 2001. Accessed 2012-02-16. ↑ Sadiq, Kamal (2005). "When States Prefer Non-Citizens Over Citizens: Conflict Over Illegal Immigration into Malaysia" (PDF). International Studies Quarterly. 49: 101–122. doi:10.1111/j.0020-8833.2005.00336.x. Retrieved 2008-04-23. ↑ "IDs will hit US voter turnout - study". Reuters. 2012-07-19. ↑ Magaloni, Beatriz. "Autocratic Elections, Voters, and the Game of Fraud" (PDF). Yale University. Retrieved 10 December 2015. ↑ Poundstone, William (2009). Gaming the Vote: Why Elections Aren't Fair (And What We Can Do About It). Macmillan. p. 170. ISBN 9780809048922. ↑ Bialik, Carl (May 14, 2011). "Latest Issue on the Ballot: How to Hold a Vote". Wall Street Journal. Retrieved June 29, 2012. ↑ "Did bomb threat stifle vote? (Capital Times)". Madison.com. Archived from the original on March 4, 2009. Retrieved 2012-05-03. ↑ Sullivan, Joseph F. (1993-11-13). "Florio's Defeat Revives Memories of G.O.P. Activities in 1981". New York Times. Retrieved 2008-10-07. 1 2 Archived October 26, 2006, at the Wayback Machine. ↑ "Incidents Of Voter Intimidation & Suppression". Web.archive.org. 2006-11-08. Archived from the original on April 4, 2007. Retrieved 2012-05-03. ↑ A History of Parliamentary Elections and Electioneering in the Old Days ... - Joseph Grego. Books.google.com. Retrieved 2015-05-29. ↑ "Parliamentary Electorates And Elections Act 1912 - Section 149, New South Wales Consolidated Acts". Austlii.edu.au. Retrieved 2012-05-03. ↑ Herbeck, Dan (November 15, 2011). Resentments abound in Seneca power struggle. The Buffalo News. Retrieved November 16, 2011. ↑ Catanese, David (August 2, 2011). "Americans for Prosperity: Wrong date a 'printing mistake'". Politico. Retrieved March 24, 2015. ↑ Vaughn, Alexa (2011-11-02). "Conservative group launches ad campaign on Solyndra loan". The Los Angeles Times. ↑ Catanese, David (August 1, 2011). "AFP Wisconsin ballots have late return date". Politico. Retrieved March 24, 2015. ↑ "Fraudulent election calls traced to Racknine Inc., an Edmonton firm with Tory links | News | National Post". News.nationalpost.com. Retrieved 2012-05-03. ↑ Roth, Zachary (2014-09-29). "Koch group investigated for faulty mailers". MSNBC. MSNBC. Retrieved 2015-05-29. ↑ Ramsey, David (Sep 30, 2014). "Americans for Prosperity sends out hundreds of thousands of mailers with fake voter registration information in North Carolina". Arkansas Times. Retrieved 2014-11-16. ↑ Lacayo, Richard. "Florida recount: In the eye of the storm". CNN. ↑ Hicks, Jonathon (July 24, 2004). "Seeing Double on Ballot: Similar Names Sow Confusion". The New York Times. The New York Times Company. Retrieved 18 December 2008. ↑ "VoteTrustUSA - Sequoia: Button On E-voting Machine Allows Multiple Votes". votetrustusa.org. ↑ "Threat Analyses & Papers". National Institute of Standards and Technology. October 7, 2005. Retrieved 5 March 2011. ↑ Jaikumar Vijayan (2011-09-28). "Argonne researchers 'hack' Diebold e-voting system". Computerworld. Retrieved 2012-05-03. ↑ Layton, J. "How can someone tamper with an electronic voting machine". Retrieved 2011-02-27. ↑ "Security Analysis of the Diebold AccuVote-TS Voting Machine" (PDF). Jhalderm.com. Retrieved 2015-05-29. 1 2 "images" (PDF). Retrieved February 17, 2012. 1 2 Bonsor and Strickland, Kevin and Jonathan. "How E-Voting Works". Retrieved 2011-02-27. ↑ Kohno, T. "Analysis of Electronic Voting System" (PDF). Retrieved 2011-02-27. ↑ ""Man in the Middle" Attacks to Subvert the Vote". Electiondefensealliance.org. Retrieved 2015-05-29. ↑ Mayer, Jane (29 October 2012). "The Voter-Fraud Myth". The New Yorker. Retrieved 9 December 2015. ↑ Rober Barnes (August 1, 2016). "Federal judge blocks N. Dakota's voter-ID law, calling it unfair to Native Americans". Washington Post. Retrieved 2016-08-02. ↑ "Is "Ghost" Voting Acceptable?". Writ.lp.findlaw.com. 2004-04-08. Retrieved 2012-05-03. ↑ "Corruption Perceptions Index". Transparency International. Transparency International. 2011. Retrieved 1 December 2011. ↑ "Why You Should Expect Challenges To Secret Ballots". The Federalist. Retrieved 16 July 2016. ↑ "Scrap the "secret" ballot – return to open voting". ↑ Todd Davies. "Consquences of the Secret Ballot" (PDF). Symbolic Systems Program, Stanford University. ↑ "Abolish the Secret Ballot". The Atlantic. 1 2 3 Lundin, Leigh (2008-08-17). "Dangerous Ideas". Voting Fiasco, Part 279.236(a). Criminal Brief. Retrieved 2010-10-07. ↑ "podmoskovnik: Cтатья о выборах из Троицкого Варианта". Podmoskovnik.livejournal.com. Retrieved 2015-05-29. ↑ 27 октября 2009 года. (2009-10-27). "Статистическое исследование результатов российских выборов 2007–2009 гг. : Троицкий вариант – Наука". Trvscience.ru. Retrieved 2015-05-29. ↑ Walter R. Mebane, Jr.; Kirill Kalinin. "Comparative Election Fraud Detection" (PDF). Personal.umich.edu. Retrieved 2015-05-29. ↑ Decourcy, Michael (1994-02-19). "Vote-Fraud Ruling Shifts Pennsylvania Senate". The New York Times. Pennsylvania. Retrieved 2015-05-29. ↑ Jeannette I. Andrade (2011-11-18). "Electoral sabotage case filed vs Arroyo, Ampatuan, Bedol". Philippine Daily Inquirer. ↑ 107th U.S. Congress (October 29, 2002). "Help America Vote Act of 2002 (Pub.L. 107-252)". U.S. Government Printing Office. Retrieved 2008-10-10. ↑ "2015: Cronista (in spanish)". ↑ "1988: The fall of the system (in spanish)". ↑ "Peru's corruption runs deep (Chicago Tribune - 18 April 2001)". Freelori.org. 2001-04-18. Retrieved 2015-06-13. ↑ "TALKING POINT | Peru: Does the election have any credibility?". News.bbc.co.uk. Retrieved 2015-06-13. ↑ "Rewriting Russian History: Did Boris Yeltsin Steal the 1996 Presidential Election?". ↑ Berman, Ari (July 28, 2015). "How the 2000 Election in Florida Led to a New Wave of Voter Disenfranchisement". The Nation. ↑ Douglas, Joshua A. "Dear Clinton supporters: Recount won't matter". CNN. Retrieved 2016-11-30. ↑ "Trump's voter fraud claims are too large not to be investigated". NY Daily News. Retrieved 2016-11-30. ↑ "Election Night Gatekeepers – The Intro". Election Night Gatekeepers. Retrieved 2016-11-30. Lehoucq, Fabrice. "Electoral fraud: Causes, types, and consequences." Annual review of political science (2003) 6#1 pp. 233–56. Atkinson, Michael M., and Gerald Bierling. "Politicians, the public and political ethics: Worlds apart." Canadian Journal of Political Science (2005) 38#4: 1003. Ebhardt, Christian. "In Search of a Political Office: Railway Directors and Electoral Corruption in Britain and France, 1820-1870." Journal of Modern European History (2013) 11#1 pp. 72–87. Ziblatt, Daniel. "Shaping Democratic Practice and the Causes of Electoral Fraud: The Case of Nineteenth-Century Germany." American Political Science Review (2009) 103#1 pp. 1–21. O'Gorman, Frank. Voters, Patrons and Parties: The Unreformed Electoral System of Hanoverian England, 1734–1832 (Oxford, 1989). Hartlyn, Jonathan, and Arturo Valenzuela, "Democracy in Latin America since 1930," in Leslie Bethell, ed. Latin America: Politics and Society since 1930 (1998), 3–66. Posada-Carbó, Eduardo. "Electoral Juggling: A Comparative History of the Corruption of Suffrage in Latin America, 1830–1930." Journal of Latin American Studies (2000). pp. 611–44. Ricci, Paolo. "‘Beheading’, Rule Manipulation and Fraud: The Approval of Election Results in Brazil, 1894–1930." Journal of Latin American Studies (2012) 44#3 pp. 495–521. Silva, Marcos Fernandes da. "The political economy of corruption in Brazil." Revista de Administração de Empresas (1999) 39#3 pp. 26–41. Fackler, Tim, and Tse-min Lin. "Political corruption and presidential elections, 1929–1992." Journal of Politics 57 (1995): 971–93. Was the 2004 Election Stolen? by Robert F. Kennedy Jr., June 1, 2006. ↑ "Practicing Democracy: Elections and Political Culture in Imperial Germany: Margaret Lavinia Anderson: 9780691048543". Amazon.com. Retrieved 2015-05-29. ↑ Philip Harling (May 1995). "Rethinking "Old Corruption"". Past & Present. Oxford University Press. 147: 127–58. JSTOR 651042. ↑ "Political Competition and Electoral Fraud: A Latin American Case Study" (PDF). Libres.uncg.edu. Retrieved 2015-05-29. ↑ "Is Something Rotten In Ankara's Mayoral Election? A Very Preliminary Statistical Analysis". Erikmeyersson.com. 2014-04-01. Retrieved 2015-05-29. ↑ "Trouble in Turkey's Elections". Erikmeyersson.com. 2014-04-06. Retrieved 2015-05-29. ↑ "Capital Fraud in Turkey? Evidence from Citizen Initiatives". Erikmeyersson.com. 2014-04-11. Retrieved 2015-05-29. ↑ Peter H. Argersinger (1986). "New Perspectives on Election Fraud in the Gilded Age". Political Science Quarterly. The Academy of Political Science. 100: 669–87. JSTOR 2151546. ↑ "Political Corruption and Presidential Elections, 1929–1992" (PDF). Repositories2.lib.utexas.edu. Retrieved 2015-05-29. ↑ Loomis Mayfield (1993). "Voting Fraud in Early Twentieth-Century Pittsburgh". The Journal of Interdisciplinary History. The MIT Press. 24: 59–84. JSTOR 205101. ↑ "Fraud of the Century: Rutherford B. Hayes, Samuel Tilden, and the Stolen Election of 1876 eBook: Roy Morris Jr.". Amazon.com. Retrieved 2015-05-29. ↑ Mark Wahlgren Summers (Author). "Party Games: Getting, Keeping, and Using Power in Gilded Age Politics: Mark Wahlgren Summers: 9780807855379". Amazon.com. Retrieved 2015-05-29.